When you need parts, you'll need to know your Murray lawn mower's model number. The model number is listed on the front of your operator's manual, but if you don't have your manual, you can find it on the machine. 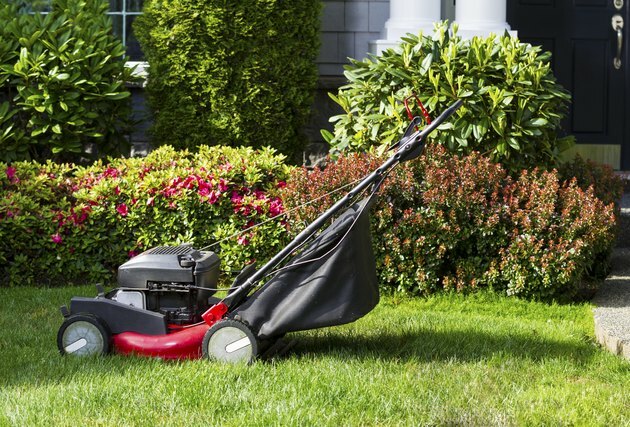 Where the model number is located on your mower depends on what type of mower you have. If you have a Murray lawn tractor or a rear-engine style mower, raise the seat and look under it for the model number. If you don't see the number under the seat, look on the frame between the rear wheels. The model number is stamped on a small metal plate, usually silver in color, attached to the mower. Look for a small metal plate with letters and numbers etched into it. It may have a model number and serial number stamped on it. For walk-behind and push mowers, the model number plate is usually on top of the deck, near the rear, between the the handle uprights. It may be stamped on a small plate. Some Murray mower identification plates list the model number, a mix of numbers and letters or just numbers, and a "date code" consisting of just numbers. The date code tells the year and day the mower was manufactured. For example, the date code 2191 indicates the machine was made in the year 2002 on the 191st day of that year. If you need to buy parts for the engine on your Murray mower, you'll need to find a separate model number for it. Engines on Murray mowers are manufactured by another company, so the model number on your lawn tractor or walk-behind mower will not get you the parts or a needed tune-up kit for your engine. Briggs & Stratton is one company that provides engines for Murray mowers. It directly stamps the model number into the engine. Look for it on the blower housing, just above the spark plug, or on the muffler's heat shield. When you've found the model number for your lawn mower, register it with Murray online. Doing this allows the manufacturer to notify you if your mower has recalls on it. Having recall work done in a timely manner keeps your mower from damage and you, the operator, safe. Also, registering your mower allows Murray to assist in its recovery should it be lost or stolen.